Well I finished lessons 1 & 2 of the beginning tatting class and I’m working on the third now. I am learning the needle tatting method and I wanted to show something I made. 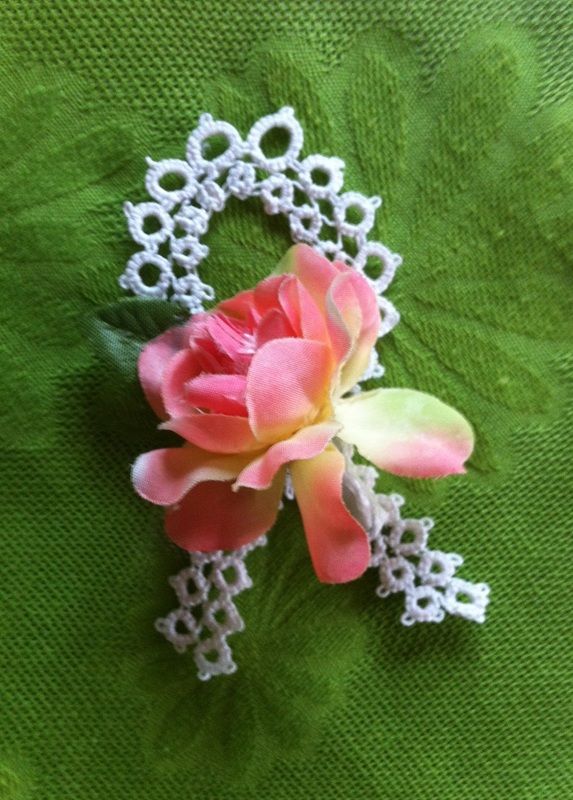 I made this tatted brooch for my aunt who’s daughter (who was my age) died unexpectedly during a routine surgery. I made an awareness ribbon in white and added a pink rose since my cousin loved the color pink. Black awareness ribbons are for mourning but white reminds me of angels. My cousin is with God and even though I miss her I know I will see her again. I added a pin to the back and stiffened the tatted lace with starch. I am sure my aunt will love it. She just had a birthday and I can’t imagine she was able to celebrate so soon after the death of her daughter. If you are interested in making a tatted awareness ribbon there is a link to the free pattern below. You can also follow my new tatting blog called My Adventures in Tatting since I don’t usually post tatting stuff here.